Submitted by Jeff Buster on Thu, 07/02/2009 - 20:11. Everything you see has economic connections. Look at your husband, he has economic connections, right? Just kidding. 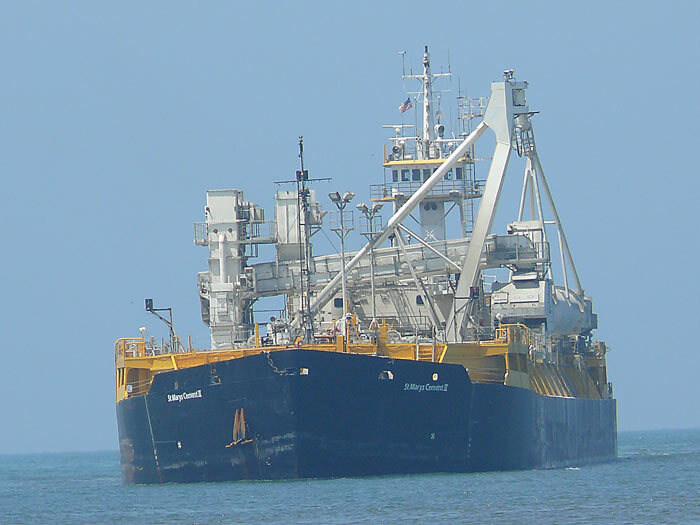 But when I watched the St Mary's II cement barge, at 21 feet of draft, come into Cleveland last week to blow off at the Essroc facility (north portion of the dock also leased by Kenmore Construction), I thought, $ WOW. Who minds this store? Is there a custom's agent who checks the tonnage discharged? Who is the agent? Ed Hauser thought the Kenmore lease was an issue. I think $ is an issue. Oengus, we need to meet so you can use your mind to look into some of this stuff. Submitted by Norm Roulet on Thu, 07/02/2009 - 20:56. Good observation. I'd love to see an independent study of our port usage and realistic future uses, especially in light of plans to expand and add massive container capacity. Is there any need? What port do we need without Mittel, and as we eliminste coal power plants? Submitted by None on Fri, 07/03/2009 - 00:44. Our port is mostly for aggregate or bulk material…if you think about long terms and sustainable then all that industry is threatened. It is all highly unaccountable, the volumes the prices the turn over of the material. There is big money in rocks… little rocks made from big rocks. I thought it funny that when Jacobs began in the flats the aggregate piles got big really fast. A huge problem is that when they load the trucks, the ones that have lots of wheels, they sometimes over load them and the road crack behind them. But that’s ok because they get paid to fix them…. It is industry but it all looks self sustaining, ODOT cycles too much and thats something about what the FBI is looking at with the county. It's the same thing, we got money and who gets it. It cyclical and fungible, we have to spend it and of course it has to increase each year. That is all about the bad behavior becoming the normal behavior. The idea of longer lasting and more durable is it or would it be blasphemy. Thick as thieves, it is all connected the ports a feeder. What does the port authority issue bonds for….things that need concrete. Submitted by None on Fri, 07/03/2009 - 10:31. I think this is interesting, but never went anywhere. A ferry service to Port Stanley? How long would that take in travel time? What is really odd is that the proposed ship would carry 250,000 passengers? Then they go on that it could carry 42,000 cars and 25,000 trucks? Ok now I know that it was a passing fancy and “on hold” since 2004, but the numbers are not only unrealistic they are actually insane. Something is not correct, they proposed the largest ship in the world, ever actually bigger than any that would ever even be considered. A virtual floating stadium? Should that have been 250 passengers 42 cars and 25 trucks? Congratulations Citizen Hauser: Whiskey Island Land Uses Resolved After Nine Years!